In this article, Peter Boggis and David Trafford argue that deploying the principles of experiential learning through one or more ‘Learning Journeys’ is an effective way of developing collective leadership from the shared insights and experiences gained. They also help executives gain the collective capabilities needed to assess the effectiveness of current strategy, explore different strategies and successfully operationalise their chosen strategy. All organisations are on a trajectory to a given future, preferably one that is better than today’s. This trajectory is a manifestation of their strategy; a strategy that has either been intentionally and explicitly defined or evolved over time. But how can executives be sure that their strategy will be successful? If the purpose of strategy is to significantly change their organisation’s trajectory, how can they be sure that this will happen? Equally, if in assessing their current strategy they conclude that a new one is required how can they be sure that it will in reality be any better? And, if they believe their current strategy will put them on the correct trajectory how can they be sure it will be successfully implemented and the targeted outcomes sustained over time? These are some of the strategic challenges executives continually face – and they do this in the knowledge that few strategies actually achieve their target outcomes. So, what can be done to increase the chances of success? In this article we will explore how Experiential Learning Journeys can help executives gain the insights needed to assess their current strategy, explore options when developing new strategies, and identify the organisational capabilities needed to successfully operationalise their chosen strategy. Firstly, let us begin by describing what we mean by experiential learning. Experiential learning or ‘learning by doing’ is very different to rote or didactic learning, in which the learner plays a comparatively passive role; it is particularly effective for intelligent, highly-educated and experienced people. Its power can easily be illustrated by asking a colleague: “what were your most powerful learning experiences?”. Over the years that we have asked this question of executives, no one has ever mentioned their time at university (though many lessons of life are learned during this period), a conference they attended or a training course they undertook. Without exception, they referred to times when they faced a really challenging situation, one that took them way out of their comfort zone and stretched them both intellectually and emotionally. They will often refer to the fact that they were learning with others whilst being challenged to deliver something important – for example, launching a new product, integrating a new acquisition or dealing with a difficult client situation. 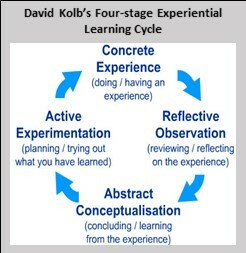 The seminal work of David Kolb in the 1980s taught us that we continuously learn through a four‐stage cycle of; Concrete Experience > Reflective Observation > Abstract Conceptualisation > Active Experimentation. 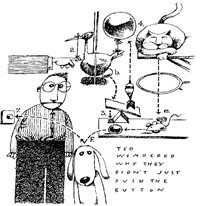 In other words, we see something, we think about it, we consider how we might apply it to our situation and we try it – we learn through experience. Colin Beard and John P Wilson’s work on experiential learning resulted in a conceptual model they call learning combination lock. The model comprises six tumblers that represent the complexity of the many possible experiential choices available. From a philosophical perspective the tumblers represent belonging, doing, sensing, feeling, thinking and being. Their argument is that learning experiences can be designed by selecting different learning combinations. While individual learning is important, shared learning is critical when it comes to developing collective leadership. Collective leadership is when a leadership team is aligned. This is not to say that they always agree or that they have the same background or education. Alignment is an outcome resulting from a shared process: a process we call a Learning Journey that comprises shared learning experiences. As we will discuss later, this alignment and resulting collective leadership is a key condition for success when it comes to assessing, developing and operationalising strategy. Learning Journeys are based upon the principles of experiential learning and are designed to achieve specific learning outcomes; for example shared insights on specific industry trends; technologies that will have a profound impact on how we do business or the capabilities needed to operationalise a given strategy. Through shared experiences and reflective discussion, participants begin to see the world differently, their perceptions change, new insights are gained and greater alignment is created. Individual perspectives: The purpose of this initial stage is to allow participants to reflect on how they see their organisation’s default future – which is the place their organisation will end up if no action is taken other than that currently planned. 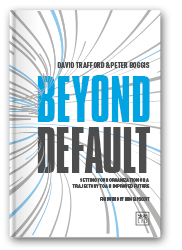 If the default future is aligned with their target future, and they are confident it can be achieved, the case for learning is less than when the default future is an unacceptable destination. Dialogic self-assessment: The purpose of the dialogic assessment is threefold. Firstly, to capture the participants’ assessment of the organisation’s ability to develop or implement strategy. Secondly, to capture their level of understanding of the relevant domains of knowledge and practice, eg digital business. And thirdly, to stimulate dialogue on the degree to which they are aligned and the reasons for any misalignment. Study visits: Where participants see first-hand how other organisations – both inside and outside their industry – are addressing similar challenges. Reflect and abstract: Having visited and observed a number of leading organisations, the underlying principles by which they operate are identified (abstracted). It is important to remember that all practices are based upon principles, and it’s the application of a principle in a specific context that establishes practices. For this reason principles are transferable whereas practices are often not. Simulate: Having identified the relevant principles, their impact is simulated within their own context. For example, if the aim was to change the organisation’s current trajectory, a simulation would answer the question “how would the application of these principles change the organisation’s trajectory to that needed?”. Ideally a number of different scenarios would be simulated and evaluated. Apply: Based upon the outcome of the simulations, the chosen principles would be applied for real in the organisation. Evaluate: The purpose of the final stage is to evaluate the degree to which the chosen operating principles are actually changing the organisation’s trajectory, and, where necessary, make any mid-course corrections. By their very nature, Learning Journeys need to be adaptive. Yes, they need to be planned from the outset, but like any other journey, things happen: participants experience the unexpected; their perceptions change as a result of insights gained; and business priorities impact on timelines. Learning Journeys are most effective when they not only impart knowledge, but change the participants’ perception of the world and the role they need to play within it. Learning Journeys can be life-changing if participants embrace the possibilities they offer. When it comes to strategy, collective leadership is critical. Gone are the days when strategy was developed by the few and ‘shared’ via PowerPoint presentations. Today the world is very different: markets are continually changing, customers are no longer loyal, technology drives innovation, sourcing is done globally and the war for talent is getting tougher. As a result, strategies need to be refreshed on a continuous basis and their successful implementation is dependent upon the contribution of virtually everyone in the organisation. This needs a level of executive alignment and collective leadership not typically seen in most organisations. Experiential Learning Journeys, ideally for the extended leadership team, can play an important role in creating the insights needed to assess the effectiveness of current strategy, developing alternative strategies or operationalising a chosen strategy. As previously discussed, all organisations have a strategy. Some strategies are intentionally and explicitly defined, while others evolve over time. The question is to what extent is the organisation’s current trajectory aligned with their strategy, and to what degree is the strategy controlling the trajectory? The reality is that few strategies achieve their target outcomes and the default future of an organisation – which is the place they will end up if no action is taken other than that currently planned – is often very different to that intended. The question is why? All too often strategies are developed in a vacuum and do not adequately consider the forces determining the organisation’s default trajectory. Some of these driving forces are comparatively easy to observe, like technology and regulation, while others, like mindsets, values and culture, are often not so apparent at first sight. Only by identifying these forces and assessing their impact can the effectiveness of a given strategy – in terms of its impact on changing an organisation’s trajectory – be effectively assessed. Experiential Learning Journeys that comprise visits to outside organisations such as technology vendors, laboratories and organisations in different sectors can give insight into the impact that the driving forces are having, and are likely to have in the future. Such visits should not be confused with best-practice visits as the aim is not to copy but to understand what is driving your industry, and the possible implications for your organisation. Below we describe a type of Learning Journey that is often called a Technology Study Tour. The purpose of these tours – that can either be for single or multiple organisations – is to get insight into how emerging technologies are changing the context – and by implication the default future – of organisations. One of the most effective ways of understanding how technology impacts an organisation’s default future is by participating in a Technology Study Tour. Often organised by technology vendors or independent research firms, they provide insights into the potentially disruptive impact of emerging technologies. They can either be multi-company, where executives from a number of companies participate, or custom-designed for a single company. They typically include visits to research centres, technology vendors or organisations using technologies innovatively. Historically, they have focused on US organisations, particularly those in Silicon Valley, but more recently include visits to new and emerging economies such as India and China. Following such a Learning Journey, business and technology executives are in a better position to assess their current strategy and explore the impact that emerging technologies might have on their default future. They are also an effective way of understanding what capabilities their organisation will need to acquire if they choose to develop a strategy based upon what these technologies offer. Developing strategy is essentially about making informed choices that, when implemented, will change the trajectory of an organisation – away from its current default future. Essentially it’s about deciding how the organisation needs to operate in the future. Equally important is making explicit what it should stop doing as all too often strategies are additive and fail to clearly articulate that the intent is for the organisation to do ‘this’ and stop doing ‘that’. If strategy is essentially about making informed choices, then these choices are best articulated through a set of operating principles, where a principle is defined as a ‘conscious choice between two equally valid alternatives’. The power of articulating strategy through a set of operating principles is that it makes the strategy meaningful to people throughout the organisation. It shows them which choices have been made – and those that have been rejected. It also defines how the leadership expects the organisation to operate in the future and provides guidance on how everyone can contribute through the decisions they make and actions they take. Experiential Learning Journeys are a powerful way of exploring alternative operating principles, whether with respect to market segments; products and services; processes; organisation, sourcing or culture. They are also an effective way of ‘experiencing the future today’ by ‘simulating’ the outcome of a given strategy before the final decision is taken to implement. Not only does simulating the future develop deeper understanding, it also triggers ideas that can improve the strategy. The case study below describes the Learning Journey undertaken by the Liverpool Heart and Chest Hospital, where the new Chief Medical Officer took his colleagues to the USA to get a shared understanding of what a strategy based upon ‘patient experience’ would mean for their hospital. Once a strategy is accepted, the focus usually moves to implementation or, as we prefer to call it, operationalising it. The assumption is that if the changes outlined in the strategy are implemented, the organisation’s trajectory will change and the target future will be realised. The main weakness of this approach is that it assumes organisations are deterministic and ‘programmable’. Yet we all know that this is not the case. Organisations are not predictable, particularly at times of significant change; they are dynamic systems that respond – often in unforeseen ways – when attempts are made to change them. As a consequence, an implementation plan is always out of date. And what is more, having such a plan can lead people to believe that it is someone else’s responsibility to action it: namely the people implementing the plan. An alternative approach – and the one that we strongly advocate – is to pull the present into the future. With this approach the organisational capabilities needed in the future state are put in place from the outset, thereby enabling the organisation to ‘pull’ itself into its target (improved) future. It’s important to note that organisational capabilities are more than the sum of individual skills and competencies. They are formed from a combination of shared mental models; common language; mindsets; processes; established practices; conventions; shared experiences and skills. Once developed, they shape the ‘way we work around here’ and if not addressed can ‘anchor’ an organisation to its current trajectory. Experiential Learning Journeys are a powerful way of identifying the organisational capabilities needed in the future state and, as equally important, how they can be best developed or acquired. The case study below describes a Learning Journey undertaken by a major German life, property and casualty insurer. In the course of developing a new strategy, the CEO recognised that the company did not have the necessary organisational capabilities needed to successfully implement it. He therefore commissioned a Learning Journey, principally for his extended leadership team, aimed at developing both the necessary capabilities and collective leadership. Having developed a new strategy, the CEO of a major German life, property and casualty insurance company realised that they did not have the organisational capabilities needed to successfully operationalise it. Having experienced the power of experiential learning for himself some years earlier he commissioned a custom-designed Learning Journey for his extended leadership team. The aim was to develop new insights into the strategic shifts the strategy was to deliver and seed the development of new organisational capabilities across the organisation. Some 35 executives and future leaders of the different businesses undertook the journey over a three-year period. The focus was on developing core capabilities in innovation, delivering compelling customer experiences, horizontal integration, shared services and IT transformation. The Learning Journey included one-on-one interviews, working sessions, study tours to the USA and application workshops. Over the three years some 20 different organisations from within and outside their sector were visited. After each visit, participants reflected on their individual and collective insights and experiences, and challenged themselves to decide how what they had learned could best be applied in their particular context. They subsequently led some of the largest transformation programmes in the industry. A further benefit was that the 35 leaders created a powerful community that meets three times every year to challenge current strategies in a safe environment. They also developed levels of trust and confidence and were able to ask one another for help, which was unprecedented in the context of a traditional, conservative German insurance group. One of the executives described the shift as follows: “Before this Learning Journey we used to address one another as “Herr Doctor” and use the “Sie” (formal) term; after this set of shared experiences, we now address one another by our first names and use the term “Du” (informal) instead of “Sie”. In today’s world organisations need to continually re-evaluate and refresh their strategies; they need to continually gain new insights and develop new organisational capabilities. In effect assessing, developing and operationalising strategy needs to become an organisational capability in itself, and Experiential Learning Journeys are an effective way of developing this capability. Highly intelligent, well-educated and experienced people learn best through what they experience. While individual learning is important, shared learning is critical when it comes to developing collective leadership. Learning Journeys – based upon the principles and best practices of Experiential Learning – are a powerful way of developing collective leadership from the shared insights and experiences gained. Experiential Learning Journeys, ideally for the extended leadership team, can play an important role in developing the collective capabilities needed to assess the effectiveness of current strategy, explore different strategies and operationalise a chosen strategy. Assessing, developing and operationalising strategy needs to become an organisational capability in itself, and Experiential Learning Journeys are an effective way of developing this capability. Experiential Learning: Experience as the Source of Learning and Development. David A Kolb, first published by Pearson Education in 1983 and the second edition in 2014. Experiential Learning: A Handbook for Education, Training and Coaching. Colin Beard and John P Wilson, first edition published by KoganPage in 2002 and the third edition in 2013.